Affordability in Perth’s residential sales market improved during the September 2018 quarter, with house and unit prices softening marginally. REIWA President Damian Collins said there was excellent opportunity for buyers and investors to take advantage of current market conditions to secure their next home or investment property. “While the worst of the market downturn appears to be behind us, the results of the September 2018 quarter reveal conditions are favourable for buyers and investors,” Mr Collins said. reiwa.com data shows Perth’s median house price should settle at $505,000 for the September 2018 quarter. “This is 1.9 per cent lower than the June 2018 quarter median and one per cent lower than last year’s September quarter,” Mr Collins said. “While quarterly median figures can be more subject to stock composition changes, the fact that the annual change is only one per cent lower suggests that we are at or near the bottom. While the overall market experienced a decline in median house price during the quarter, 57 suburbs across the area bucked this trend. “The top performing suburbs for median house price growth were Swan View, East Cannington, Como, Hillarys and Cottesloe.” Mr Collins said. There were fewer sales in the September 2018 quarter than there were during the June 2018 quarter. Mr Collins said reiwa.com data showed 6,428 sales for the quarter, which was 4.9 per cent lower than last quarter. “It’s not uncommon to experience a decline in sales during the September quarter, with West Australians typically less inclined to search for property during winter. We tend to see activity slow during the winter months before increasing again as the weather warms up,” Mr Collins said. 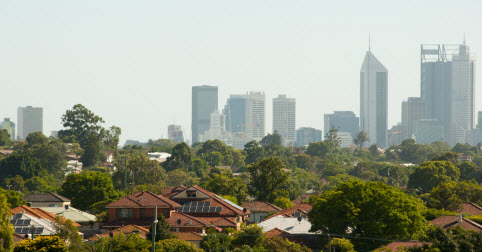 The share of house sales in Perth has increased, with reiwa.com data showing houses now comprise 74 per cent of all sales, compared to 65 per cent at the same time last year. Perth’s top selling suburbs for house sales during the September 2018 quarter were Baldivis, Canning Vale, Morley, Dianella and Gosnells, while the suburbs to record the biggest improvement in house sales activity were Cooloongup, The Vines, Alexander Heights, Mirrabooka and Wattle Grove. “It’s a good time to buy, which is reflected in the fact a higher proportion of houses are now being sold. This shift in the composition of sales (houses, units and land) indicates buyers are more inclined to purchase a house than they might have otherwise been. This can be attributed to housing affordability improving across the metro area, which has made buying a house a more attainable property purchase,” Mr Collins said. There were 13,850 properties for sale in Perth at the end of the September 2018 quarter. Mr Collins said stock levels across the metro area had declined 3.7 per cent during the quarter. “It’s pleasing that, although there were fewer sales this quarter, listing stock continues to be absorbed. “This is the third consecutive quarter we’ve seen listings for sale decline, which is a positive step forward in the market’s recovery,” Mr Collins said.